viaLibri ~ Concordantia in XXII libros De ciuitate Dei S. Aurelii Augustini. A Concordance to the Corpus Christianorum (1955) edition (from the Dombart & Kalb text of 1928-29) and procedures for adaptations to other editions by Rodney H. Cooper and Leo C. Ferrari with Peter M. Ruddock and J. Robert Smith. (6 Bde. = 6 vols.). Augustinus ed. by Rodney H. Cooper / Leo C. Ferrari. Concordantia in XXII libros De ciuitate Dei S. Aurelii Augustini. 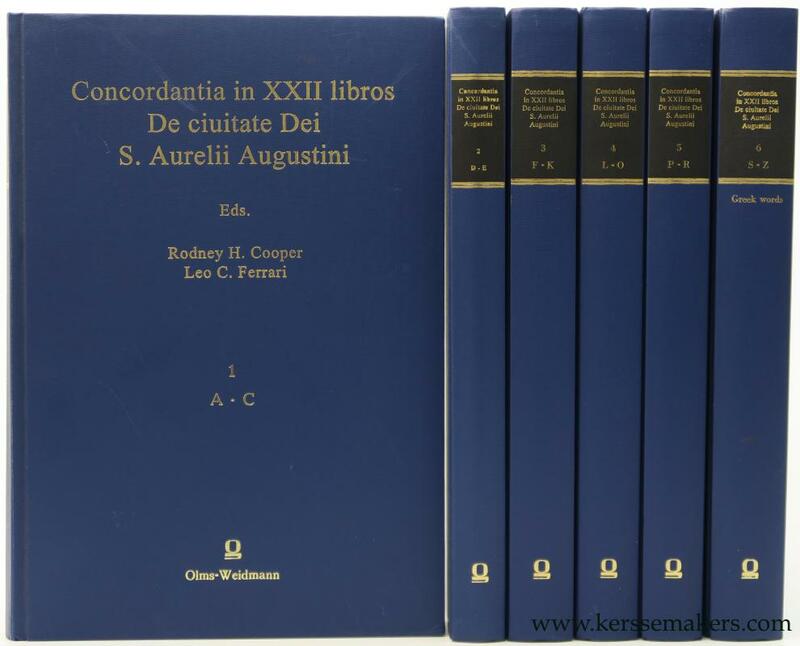 A Concordance to the Corpus Christianorum (1955) edition (from the Dombart & Kalb text of 1928-29) and procedures for adaptations to other editions by Rodney H. Cooper and Leo C. Ferrari with Peter M. Ruddock and J. Robert Smith. (6 Bde. = 6 vols.). Hildesheim / Zürich / New York, Olms-Weidmann, 1999. 6 volumes. Orig. blue cloth, gilt. Together xvi,3134 pages; 30x21 cm. Series = Reihe: "ALPHA-OMEGA, REIHE A Band CL" Price when new is 748 euros. As good as new. See picture. ISBN: 348710783X.